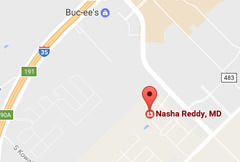 Dr. Reddy received her Bachelor of Science degree in Chemical Engineering from the University of Minnesota and her Medical Degree from the University of Minnesota Medical School. She completed her residency in Obstetrics and Gynecology at the University of Texas Health Sciences Center San Antonio in 2004. She was board certified by the American Board of Obstetrics and Gynecology in 2006 and is an active member of the Alpha Omega Alpha Honor Medical Society. 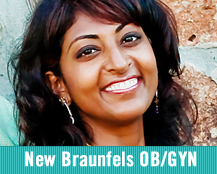 She currently serves on the Women and Children’s Committee at Resolute Health Hospital in New Braunfels. At the end of my first trimester I was experiencing back spasms and awful pain and tingling sensation in my right arm. It was very disruptive to my busy schedule as a working mom. Dr. Reddy recommended six weeks of physical therapy from the wonderful people at Christus Santa Rose Rehabilitation Center. I am happy to report that the spasms in my back have stopped and have a 95% symptom reduction in my arm. I kept up with the very simple exercises they taught me and life is so much easier.